Kitsap County is located on the Kitsap Peninsula in northwestern Washington state, in between the Olympic Peninsula and Seattle on the mainland. The county is the smallest in the state by land area, but the third most densely packed in terms of population, which is just over 250,000. It sits in the Puget Sound and has over 250 miles of shoreline. The major metro area here is Bremerton-Silverdale; other cities include Poulsbo, Bangor, Port Orchard, Bainbridge Island, Keyport, and Suquamish. This county is known as the home of Naval Base Kitsap, created out of NSB Bangor, NB Bremerton, NUWC Keyport, and the Puget Sound Naval Shipyard. The Kitsap Peninsula is, of course, accessible by land, but the ferry system is a much more common and efficient way to reach Seattle or Tacoma. 4 Beds | 3.5 Baths | 2700 sq. Ft.
3 Beds | 1.5 Baths | 2429 sq. Ft.
4 Beds | 3 Baths | 2984 sq. Ft.
5 Beds | 3 Baths | 4777 sq. Ft.
2 Beds | 2 Baths | 1759 sq. Ft.
5 Beds | 2.5 Baths | 2526 sq. Ft.
4 Beds | 2.75 Baths | 2763 sq. Ft.
3 Beds | 2 Baths | 2026 sq. Ft.
3 Beds | 2 Baths | 1658 sq. Ft.
Blue Summit Realty has the most accurate and up to date Kitsap County real estate listings on the web. Currently there are 463 homes for sale, 25 condos for sale, 18 rental properties, and 382 vacant land properties in Kitsap County. Of the 897 total Kitsap County residential listings for sale 7 are bank owned, 3 are short sales and 145 are new construction and 2 are townhomes. The price ranges from $94,300 to $6,298,000 with a median list price of $530,308 and median sold price of $351,512. 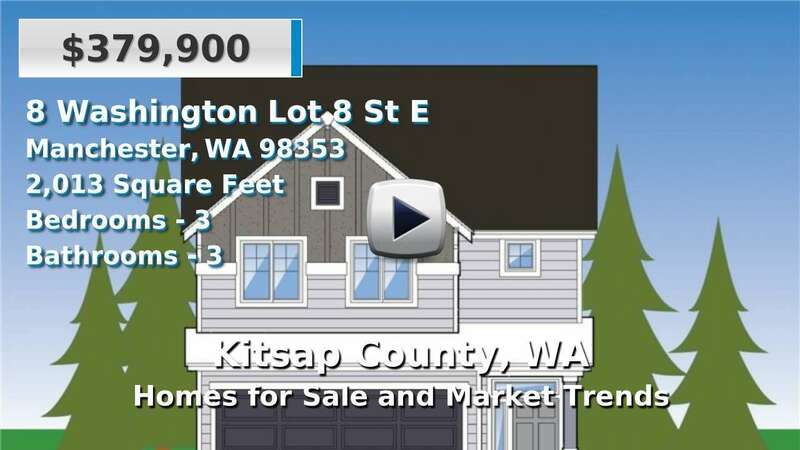 Make sure to refine your Kitsap County real estate search by property type, price, square footage, bedrooms, bathrooms and more with the search tool above or view the Kitsap County listings on our interactive map. Our Kitsap County real estate listings were updated 13 minutes ago.